Background/Purpose: Hand bone mineral density (BMD) loss is an independent predictor of radiographic joint progression,1 and a potential indicator of vertebral and non-vertebral fracture risk.2 The relationship between hand BMD loss and anti-cyclic citrullinated peptide-2 antibodies (anti-CCP2, a surrogate of anti-citrullinated protein antibodies [ACPA]) in patients (pts) with established RA is unclear. Therefore, we evaluated this association to assess joint progression and fracture risk in pts with established RA. Methods: Pts enrolled in a single academic center, prospective, observational cohort registry of RA patients, established in 2003, were included. The registry comprises mostly pts with established RA; digitized hand radiographs were collected at baseline and every 2–3 yrs (± 3 mths) over 15 yrs from which hand BMD was measured using digital X-ray radiogrammetry (DXR–BMD; methodology: Sectra [Sweden]). The current cross-sectional analysis is based on available data of DXR-BMD and anti-CCP2 measured within 6 months. Anti-CCP2–IgG-positive (+) pts (≥20 U/mL) were distributed into equal groups (Gp1–3), representing increasing anti-CCP2 concentrations. Associations between DXR–BMD and anti-CCP2 status and titers (Gp1–3; categorical variable) were explored in univariate and multivariate regression analyses controlling for covariates (age, RA duration, BMI, smoking status and use of steroids, biologic DMARD, and osteoporosis medication). The association between DAS28 (CRP) remission (<2.6) and bone loss was analyzed in pts with DXR–BMD ≥0.5 and <0.5. Results: A total of 149 pts (all women) were included (47 anti-CCP2 negative [–], 102 anti-CCP2+ [34 per group]). Age (mean: 60–63 yrs), BMI (mean: 26–29 kg/m2), DAS28 (CRP; median 3.7–4.2) and biologic DMARD use (43–56%) did not differ by anti-CCP2 status (+/–) or titer group; mean disease duration was greater in the three anti-CCP2+ titer groups versus the anti-CCP2– group (p=0.0215). 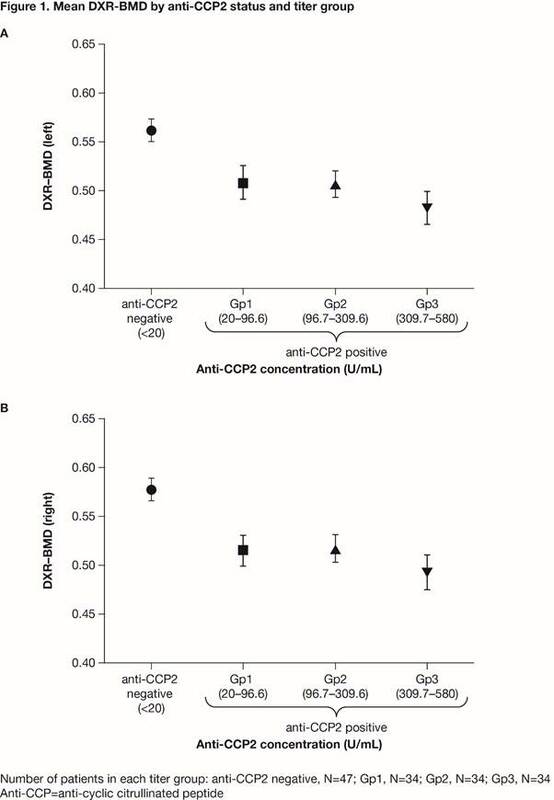 DXR–BMD was higher in the anti-CCP2– versus the anti-CCP2+ groups (anti-CCP2– vs Gp1–3: p<0.0001 for left and right hand). DXR–BMD decreased with increasing anti-CCP2 titer increase (Figure 1; linear trend p<0.001 for left and right hand). Patients with low DXR–BMD were less likely to be in DAS28 (CRP) remission (DXR–BMD ≥0.5, 36.5% vs DXR–BMD <0.5, 18.8%; p<0.05). Even after controlling for baseline confounding factors, the odds of being in remission were significantly lower for pts with DXR–BMD <0.5 versus ≥0.5 (odds ratio [95% CI], 0.355 [0.126, 0.998]; p=0.0496). Conclusion: These data suggest that anti-CCP2+ pts with established RA, particularly those with high anti-CCP2 titers, have lower hand BMD and patients with lower hand BMD are less likely to be in remission. Such patients could be at increased risk of joint progression and fracture. 1. Hoff M, et al. Ann Rheum Dis 2009;68:324–9. 2. Haugeberg G, et al. Ann Rheum Dis 2004;63:1331–4. Disclosure: H. Ahmad, Bristol-Myers Squibb, 1,Bristol-Myers Squibb, 3; E. Alemao, Bristol-Myers Squibb, 1,Bristol-Myers Squibb, 3; Z. Guo, Bristol-Myers Squibb, 1,Bristol-Myers Squibb, 3; M. Frits, None; M. Weinblatt, Amgen, BMS, Crescendo Bioscience, UCB, 2,Amgen, BMS, Crescendo Bioscience, UCB, 5; N. A. Shadick, UCB, Amgen, Crescendo Biosciences, BMS, Mallinckrodt, 2,Bristol-Myers Squibb, 5. Ahmad H, Alemao E, Guo Z, Frits M, Weinblatt M, Shadick NA. Association of Anti-Citrullinated Protein Antibody Positivity and Titer Levels to Low Hand BMD, and the Consequence of Low Hand BMD on DAS28 (CRP) Remission in Established RA: Findings from a US Observational Cohort [abstract]. Arthritis Rheumatol. 2016; 68 (suppl 10). 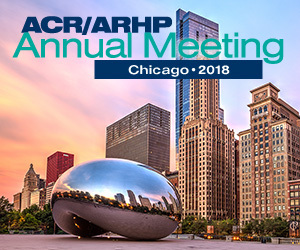 https://acrabstracts.org/abstract/association-of-anti-citrullinated-protein-antibody-positivity-and-titer-levels-to-low-hand-bmd-and-the-consequence-of-low-hand-bmd-on-das28-crp-remission-in-established-ra-findings-from-a-us-obser/. Accessed April 18, 2019.